Night Court, originally uploaded by Michael Mitchener. Growing up in Vancouver, fog was almost as common as rain. I didn't realize what I was taking for granted until I moved to Toronto and discovered photography. In Toronto, fog is about as common as killer whales on Yonge Street which is unfortunate as fog can really add to the atmosphere of a shot. Many of my photographer buddies feel the same way as I do so if there is a patch of mist in the forecast, word often gets out by e-mail on the fog network and gaggles of fog-starved photographers hit the streets looking for that perfect shot. Finding an e-mail in my inbox with the subject, "FOG!" is usually my first clue that fog might be coming to town. It's been way too long since we had a spot of fog in Toronto and I say we're overdue. I'll be watching the long range forecast for a hint of the magical stuff and will be ready to send out mass e-mails to my fellow lunatics if I spot some. Please keep your collective fingers crossed. 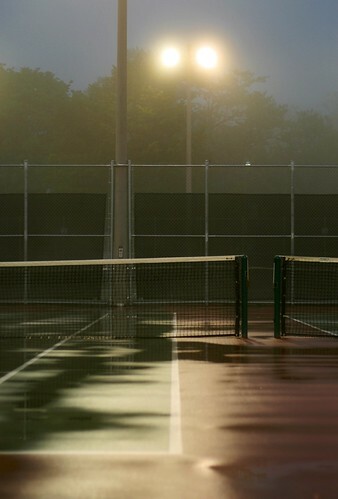 I took this tennis court shot on a rare foggy evening in the Beach and I liked what the mist did to defuse the lighting. Check out some of my other too rare fog captures on my flickr site.